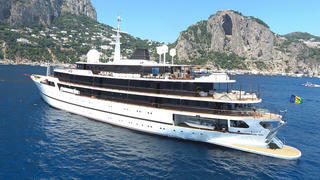 Classic superyacht Chakra has completed a three-month refit at Greek yard SSH Maritime, which included a 13 metre extension. 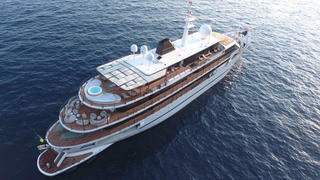 Measuring 80 metres LOA (excluding a six metre bowsprit) she is one of the largest superyachts in the world. As well as an aesthetic refresh, which changed her yellow exterior to white, the SSH refit also included fitting an extended bathing platform to this steel displacement yacht. First launched in 1963 at Dutch yard Van Der Werf as a commercial vessel, Chakra was converted into a superyacht at British yard Devonport Yachts in 1998. Accommodation is for 42 guests across 21 cabins, including a full-beam VIP with his and hers en-suites, while the crew quarters allow for a staff of up to 43. Her refreshed interiors feature light upholstery to contrast with the hardwood decks. Moving inside, Chakra boasts a massage room, beauty parlour, and superyacht gym, as well as a fully-stocked tender garage, which houses two RIBs, six Yamaha Wave Runners and a 12 metre Sessa dayboat. Her single MAN B&W Alpha engine provides a total power output of 3,996hp, which translates into a top speed of around 15 knots, while Chakra’s total fuel capacity of 136,100 litres give her a globe-trotting cruising range in excess of 10,000 nautical miles at ten knots.